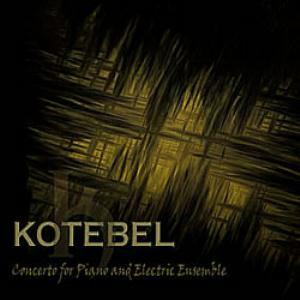 Opening this latest offering from Carlos Plaza's Kotebel is the 43-minute, four part title suite, which is ostensibly a piece of serious symphonic music arranged for piano (played by Adriana Nathalie Plaza Engelke) and electronic keyboards (Carlos Plaza), with the remainder of the band (drums, acoustic and electric guitars, bass) supporting this all-instrumental effort brilliantly. The piece is nearly overwhelming on the first listen, but thoroughly enjoyable nonetheless. After several spins, the nuances and subtleties, as well as the labyrinthine nature of this massive composition begin to reveal themselves. After a dozen plays in preparation for this review, I'm still hearing new things each time. The companion DVD goes into the making of this piece, and is a nice supplement, but ultimately "Concerto" stands strong on its own, and they could have ended the album here, but there are four more tracks totaling another 24 minutes tacked on to the end, including a seven-minute instrumental cut from 2008, perhaps a left-over from their last album Ouroboros. Curiously missing in the proceedings here are the band’s singer and flute player, though a guest sax player is featured on some of the later cuts, turning in some powerful solos and interplay with the guitarist. All taken, this is a mightily impressive musical achievement, full of magnificence and refinement, compositional complexity, subtle melodic shades and powerful dynamics. It's all here.